The first settled pastor in South Jersey was Isreal Holg Fluviander who was assigned as Garrison priest at Ft. Elfsborg (near Salem) in 1643. But after the departure of Governor Printz and the loss of New Sweden to the Dutch, the Swedish and Finnish settlers in what was called "West Jersey" had to worship on the other side of the Delaware. With the renewal of the Church of Sweden's mission on the Delaware in 1697, the pastor of Gloria Dei, Wicaco, ministered to the needs of those living at Sveaborg (Swedesboro) and north of the Racoon Creek. But the passage across the river was treacherous and impossible in bad weather. Finally in 1701 Hans Stahl, a lay member of Holy Trinity, Wilmington, DE, was appointed as schoolmaster and lay preacher for the Swedes and Finns of New Jersey. 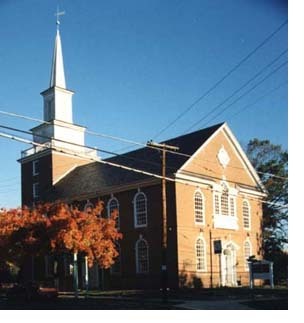 He began the first regular services, but the pastors in Christina and Wicaco opposed the establishment of a Jersey parish until the debts for the new church buildings on the western side of the Delaware were satisfied. This situation changed with the arrival of Lars Tollstadius, a priest of the Church of Sweden, who arrived in the Delaware Valley in 1701 without the approval of the Uppsala Consistory. At first he assisted the ailing Andreas Rudman at Gloria Dei, but when Rudman's appointed successor, Andreas Sandel, arrived he was without a position. He then went to Sveaborg and organized a parish on the banks of the Racoon creek. Twenty acres of land were purchased and later 80 more. A log church was built on the land beside the King's Highway and dedicated on the 3rd Sunday after Trinity, 1705. After Tollstadius' apparent suicide in 1706 (he was under indictment by the Burlington Court), he was succeeded by Jonas Auren, one of the three pastors to arrive in 1697. Auren died of a contagious disease after seven years and is buried somewhere in the Trinity churchyard. His place was taken by Abraham Lidenius who had recently arrived as a general assistant. A petition was prepared to Bishop Svedberg in Skara and finally the organization of the parish was officially approved (1715) along with the establishment of a congregation in Penn's Neck. During most of the Colonial period, one priest served both congregations, living in a rectory in Pilesgrove Township (near Woodstown) after its purchase in 1720. 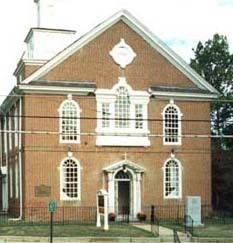 Considerable trouble from Moravian dissenters caused a division in the congregation and the establishment of the Zion Moravian Church of Oldman's Creek, south of Swedesboro, in 1743 (present building, 1786) and a chapel on the Maurice River (Port Elizabeth) in 1746. Special mention should be made of Peter Kalm, a naturalist from the University of Åbo in Swedish-speaking Finland, who visited Sveaborg in 1748-1749. His visit coincided with the untimely death of the rector, Johan Sandin. Kalm supplied the congregation for a year as a layman and married Sandin's widow before his return to Finland and ordination in the Church. His description of the flora of America and his diary are a primary source for knowledge of New Sweden and its inhabitants. 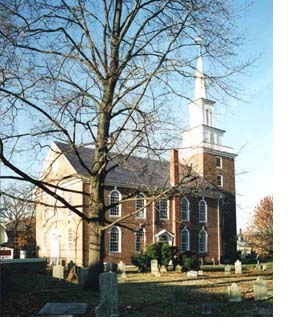 The congregation was granted an English charter in 1765 and in 1770 Nils Collin arrived and led the congregation through the American Revolution and in the building of the present brick church (1783 - 1786). It is the largest of the Old Swedes' buildings, being 41' by 61' with a balcony around three sides. Its distinct Georgian architecture is related to Christ Church and St. Peter's in Philadelphia. Following Collin's departure to Philadelphia, John Croes, an Anglican divinity student, became lay reader of the congregation. He was ordained in 1790 and was the first Episcopalian priest to serve the congregation. After his 11 years at Swedesboro, he served a congregation in New Brunswick and was then elected as the first bishop of New Jersey (1815). The tower and steeple, thought to be designed by the same architect who built the tower for Independence Hall, were completed in 1839. In 1938, H.R.H. Prince Bertil dedicated a bronze tablet on the rear wall in commemoration of the 300th anniversary of the arrival of the Swedes in the Delaware Valley. In 1976 a small plot of land overlooking the Racoon creek was dedicated as the New Sweden Park. It marks the exact location of the original log church. In 1988 a log cabin outbuilding from a Swedish farm (the VanLear-Schorn Log Cabin) was moved to the north end of the cemetery in the park. The roof of the church was restored and strengthened in 1996, and the steeple is currently being restored. None of the original furnishings remain, but a Colonial atmosphere is carefully maintained. Among the principal treasures of the congregation is the 18th century silver communion service. Many original Swedish and Finnish colonists are buried in the cemetery, including Peter Gunnarson Rambo, a Justice for William Penn under English rule. On the exterior of the building are the initials of many who worked on the erection of the church, but Nils Collin's carved words, "Gloria Deoll - to the Glory of God - remain as perhaps the best summary of the work of the congregation.